Offense’s around the country have started using the Zone Read game to have the Quarterback attack the backside of the Inside Zone. On the Zone Read the Linebacker can get easily sucked into defending the threat of the Inside Zone from the Running Back and can lose his ability to make a play on the Quarterback if he keeps it. A simple fix that defenses across the country have been going to is to get the Safety involved in the run fit. The effect of using the Safety to come up and stop the run is two fold. First this allows the Linebacker to play freely and attack the Running Back on the Inside Zone track. One of the worst things a coach can do to a player is to give him too many instructions. The effect is that the player will begin to overthink his assignment and not be effective. By using the Safety as the force player the linebacker is now freed up to play the game and use his gifts. The other major effect that getting the Safety involved in stopping the Zone Read is to bring an extra defender in the box. The Spread offensive mindset is based around numbers. They want to spread the defense out so that there are six players in the box. If the Quarterback is able to read one player and the offensive line is able to block the other five, then the offense has a numbers advantage and should have a successful play. By bringing the Safety into the box after the snap the defense is allowing the offense to think they have a numbers advantage pre-snap. As the play continues the Safety will get a run read and attack downhill. Because the threat of the QB running the ball does not happen right away, the Safety has time to come down and make the tackle before he makes a large gain. This can cause the offensive coordinator to get frustrated and move away from the play call. In order to successfully get the Safety involved in stopping the run there are a few things that need to happen. First, because the Safety is not going to be the deep defender there needs to be a change in coverage. The standard rule is to move from a Cloud look, where the Cornerback is covering the flats and the Safety is the deep defender, to a Sky look. 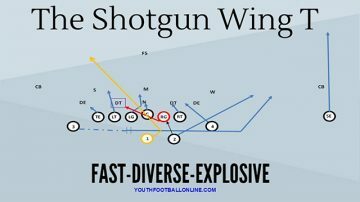 In the Sky look the Cornerback is going to be the deep defender and the Safety will be responsible for the covering any routes into the flat. This allows the Safety to come down and play the run and not worry about the deep pass. The other crucial element is that the Safety must read the Tackle to his side and be taught the difference between a run and a pass block. In a run block the Tackle is going to fire out and keep his body position low while on a pass block the Tackle will be stepping back and his head will raise higher. By reading the Tackle, the Safety will have an indication of what the play is going to be and how he should respond. When the offense is spreading teams out and trying to use the Quarterback read to gain a numbers advantage they tilt the numbers advantage to their side. As a defense it’s important to find a way to even the playing field. Using the Safety in the run game is a great way to win the numbers battle while still staying sound against the pass.